Football is very important, especially for many smaller regional communities. For some it’s because the football and netball club maintains the town name despite the town struggling with the changes of time. But for most it’s because the club is where the community now puts its collective energies. It’s a place where people of different ages and educations and life experiences and personalities can thrive. The football and netball club is very, very important to the Wimmera towns of Minyip and Murtoa. Both small towns have empty shops that display signs of the days when the towns were busy with people with the skills to do tasks by hand rather than by the machines that are used today. The club is an expression of that community, a strong statement that the community is alive. 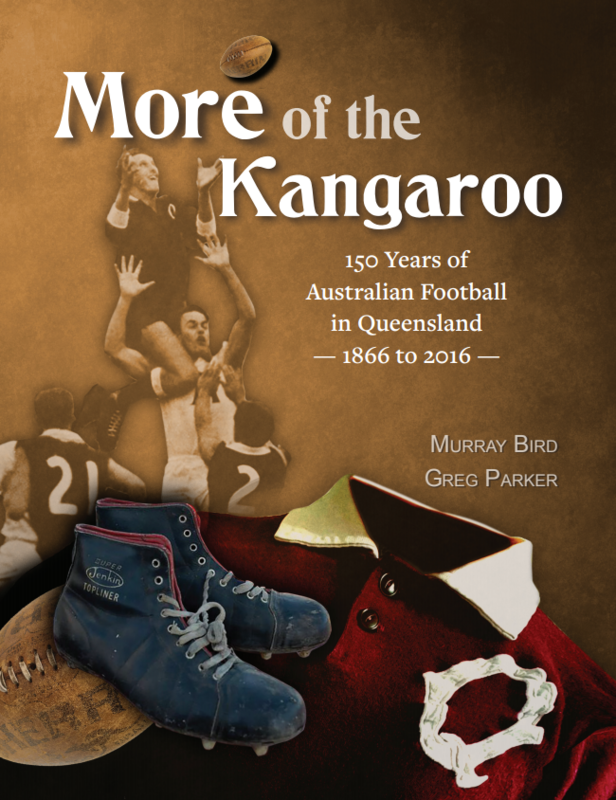 The Minyip-Murtoa FC – the Kookaburras, or Burras is the product of some practical thinking, fast acting local football administration in the 1990s. In 1995, these people secured community agreement to merge two teams despite the neighbourly tension of decades of fierce and incredibly competitive sporting rivalry. It helped that the newly formed Burras could assemble one impressive senior team (rather than two mediocre teams) and a reserves team (rather than two teams with the weekly challenge of avoiding the forfeit). Success was immediate with three senior flags in just four years. But the stars’ legs wearied and the competitive fortunes of the Burras waned. Dark sporting days followed. Turning up for a match knowing you are uncompetitive can be soul destroying and it’s been the breaking of some quality community volunteers. The Burras needed to change what was happening. They agreed that they wanted to be the sort of community club where people looking for a place in that community would be welcomed. There would be no spending up big. It would be a slow build, but one intended to last well into the future. Things began to change. An unexpected Under 14 flag was a bonus. A run of grand finals for the Under 17s drew huge local support and provided some optimism for the future. Things were changing. But the young ones tend to leave the small towns for study and employment opportunities. The small town clubs know they develop them as players and watch them leave! But some travelled back to the Wimmera to play. And others who moved to the district were attracted to the community focus of the reviving Burras. Rewards come in different forms. 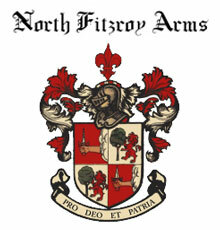 The community focus of the club attracted more new people. The club became competitive on the field. So, now, it’s September 3, 2016. Wimmera Football & Netball Grand Finals day. The Minyip/Murtoa Football & Netball Club is represented by the Senior and Reserves football teams and the A Grade and B Grade netball teams. Positive signs of change. 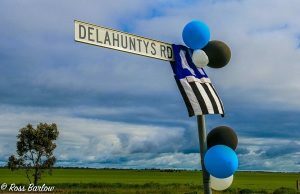 Both towns and the roads into the Horsham venue are a sea of back and blue: streamers, balloons, footy jumpers and signs for the teams or favourite players everywhere. The community has been busy. The Seniors are the underdogs against last year’s premiers, Horsham Saints. The Saints have had the better of the Burras in recent contests and start favourites, but a close game is expected. 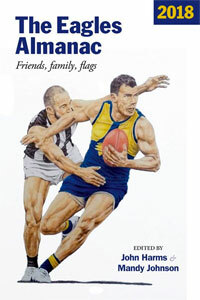 The Reserves, or Hoddo’s Heroes as they are known, battle the Stawell Warriors. The final margins in their three games through the year has been less than a goal. Nothing different is expected today. The netballers are considered to have done a mighty job to reach the final. 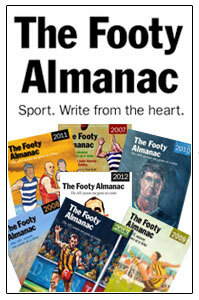 Horsham Demons and Ararat have been the standout teams through the season. Horsham City oval is in perfect condition. A big crowd is in attendance despite the promised scattered squally showers. 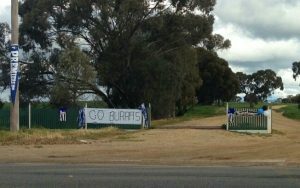 The Burras’ community is in the supporting uniform – it’s a sea of Black and Blue. But it’s a tricky day. The wind blows strongly down the ground, then not at all, and continues to blow then stops without reason through the afternoon. The scattered showers arrive and persist. Conditions are slipper. In between the sun shines brightly to emphasize the fickleness of it all. Who will be advantaged by the lottery that is the conditions. There are four gripping contests. All worthy of grand finals. In all games no team can grab a decisive advantage. 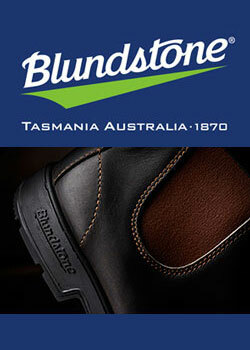 But there is disappointment for the Burras. In the main game the Saints kick a late goal to grab a 2 point win. In the early game Stawell got to celebrate a 4 point win to deny Huddo’s Heroes. On the netball court, despite leading for much of the A Grade match, the Burra girls found the Demons too strong late. But there are Burra celebrations for the B Grade netballers who led from the start and proved the better team on the day. Despite the disappointment felt by some, many hundreds of people turned out for a festive post games celebration by a community that felt proud that their little towns had been well represented in contests against the bigger towns. And, of course, the talk was already of next year. Next year. That sense of hope is important to the identity of the Minyip and Murtoa communities. I’m interested in Murtoa. The great Australian psychiatrist John Cade was born there. We’re thinking of popping in there in November, after the Donald Cup. I’mt curious if there’s any markers/sites, etc dedicated to Cade. He was a great figure in 20th century medicine, thus am curious in knowing more about him. Great to see the colours of the source teams preserved of sorts – and an original nickname. So-ooo good that team is not called Crows, Power, Dockers, or Giants………. they called them selves the Northern Jets. The team is based in southern NSW – the nearest airport for jets is in Wagga. The fathers of a couple of good mates coached Murtoa back in the day so I take a keen interest in the fortunes of the Burras. From this piece it seems as if the club is in good hands.